Artist's concept of the DARPA Airborne Satellite Launch Vehicle under an F-15E aircraft. And you thought space launches couldn't get any cooler: The next generation of small satellites may blast into orbit from the belly of a fighter jet. 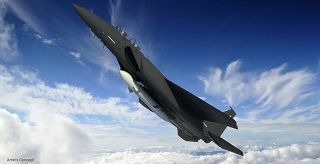 The United States military's Defense Advanced Research Projects Agency (DARPA) gave Boeing a $30.6 million contract last month to develop a 24-foot (7.3-meter) launch vehicle that would attach to the bottom of an F-15E Strike Eagle. The concept calls for the jet to drop this vehicle when it reaches an altitude of 40,000 feet (12,192 meters), at which point the craft's rocket engines would kick on, carrying onboard satellites into orbit. This launch system could slash the cost of launching small satellites — those weighing up to 100 pounds (45 kilograms) — by 66 percent if all goes well, Boeing officials said. The fighter-jet system would not only be a cheaper approach than the usual throwaway rocket stages, officials added, but also would be a quicker way to send satellites into orbit. The United States military would not need to wait around for a launch vehicle to be available or a launch window to open. "We developed a cost-effective design by moving the engines forward on the launch vehicle," Steve Johnston, Boeing's director of advanced space exploration, said in a statement. "With our design, the first and second stages are powered by the same engines, reducing weight and complexity." DARPA also wants to reduce the cost of access to space for much bigger payloads. The agency's Experimental Spaceplane project, or XS-1, aims to develop a vehicle capable of launching 3,000- to 5,000-lb (1,361 to 2,268 kg) payloads to orbit for less than $5 million per flight. Follow Elizabeth Howell @howellspace. Follow us @Spacedotcom, Facebook and Google+. Originally published on Space.com.